On the surface, the country of Japan appears to be a very homogeneous place. And in many ways it is. Tradition runs deep, rules are adhered to and everyone seems to know their place in the hierarchy. There’s a reason why one of the dominating images of the country is one of suited salarymen packing into commuter trains during the morning rush hour. But we’ve always known alongside of that there exists a different kind of Japan – one that’s full of craftsman, creators, artists and rebels. 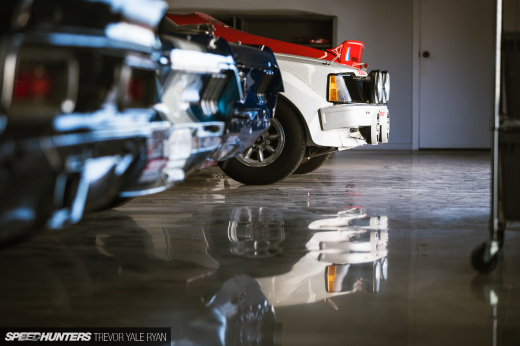 It’s really because of that second group that we’ve taken such a liking to the country’s automotive culture. 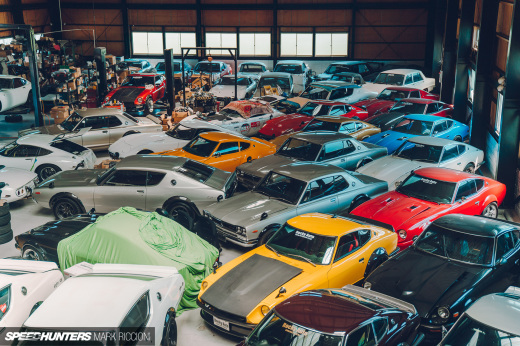 These are the people that build and drive the coolest cars and have the most interesting stories to tell – and it’s with them that we spend so much of our time. 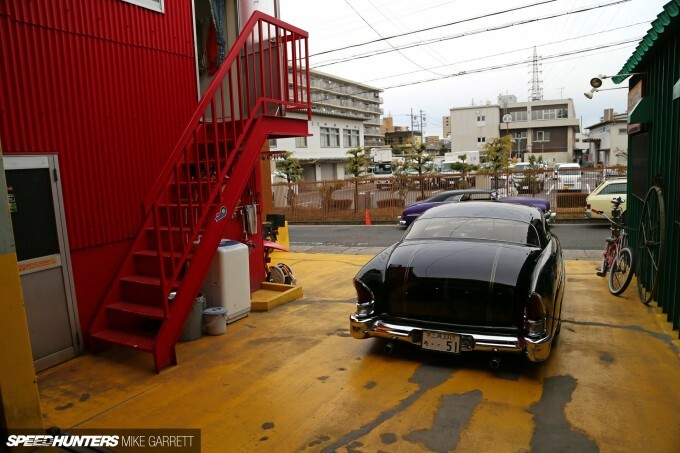 For the latest in this line of tales about Japanese car builders, we find ourselves on the streets of Nagoya’s Tempaku Ward. For the most part, this area looks pretty typical. There are apartment buildings, schools, offices, convenience stores and a whole lot of powerlines. But then you come across a building that looks unlike anything else in the neighborhood. 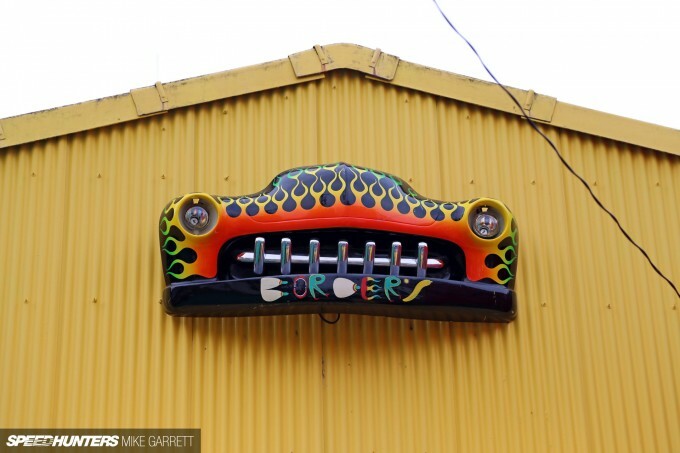 The entire thing is painted in a striking combination of green, yellow and red. 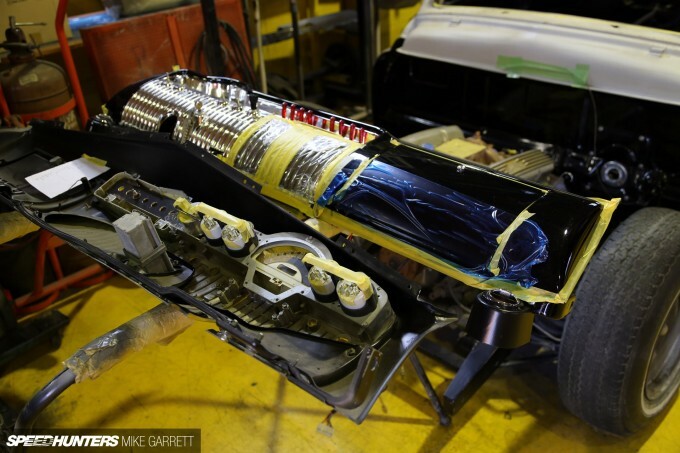 There’s also the front end of an old Mercury attached. 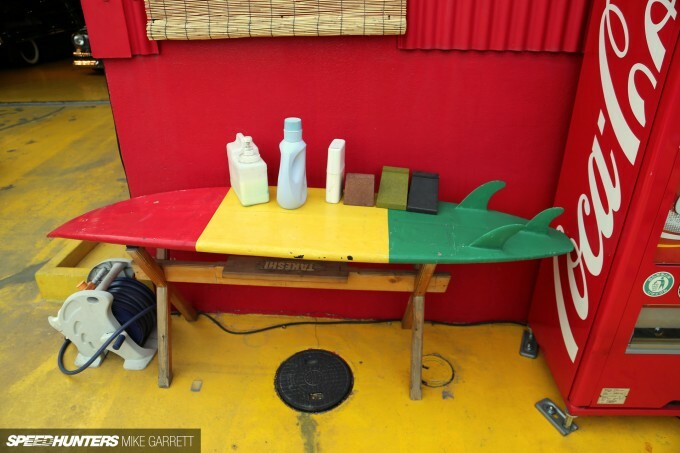 Down below sits work bench fashioned from a surfboard and painted in a matching color scheme. 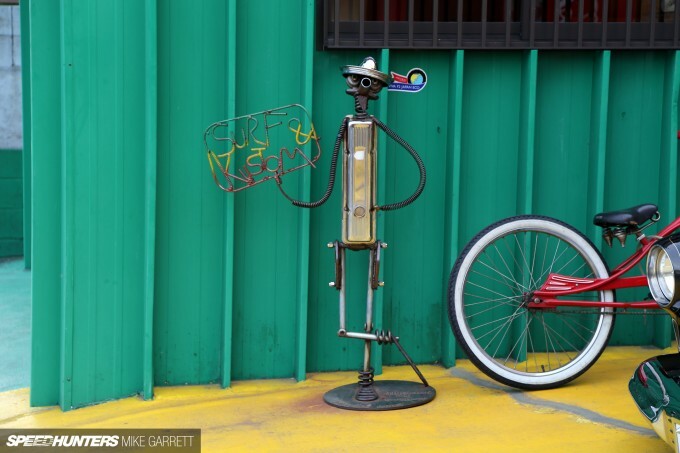 And all the while a little fellow built entirely out of old car parts keeps watch over everything. 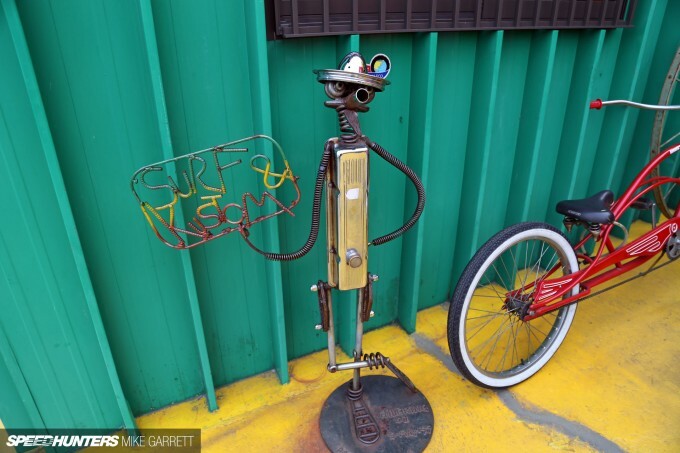 He holds a sign which reads ‘Surf & Kustom’. 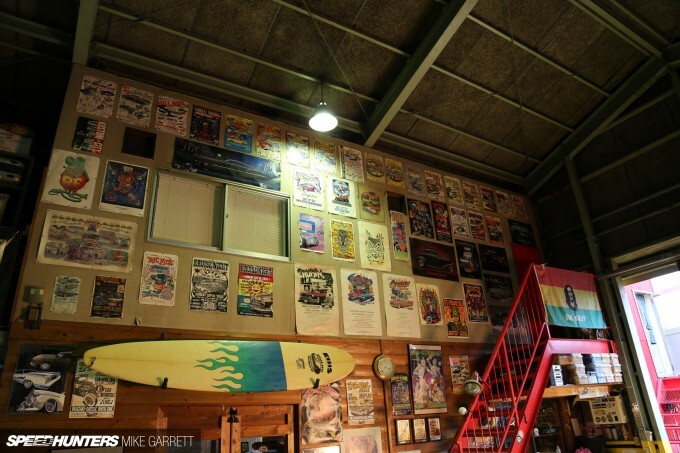 Welcome to Border’s Inc. – part surf shop, part custom car builder, and one of the most memorable of the many workshops and garages I’ve visited in Japan. 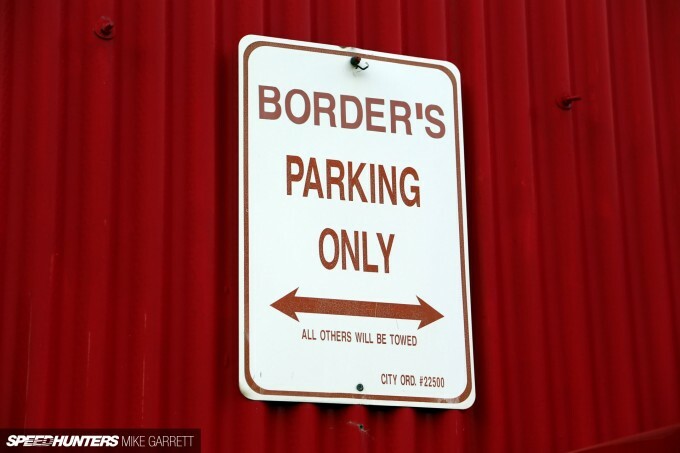 Border’s was a place I’d heard a lot about over the years, and once I had the chance to see it for myself I realized why it’s held in such high regard. 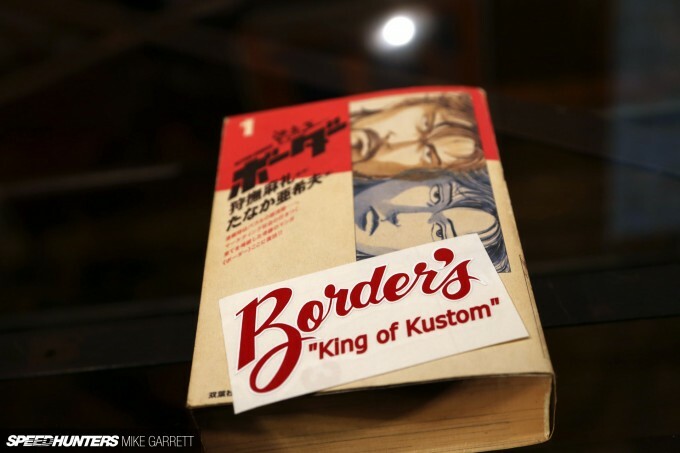 Along with Paradise Road, Border’s is one the most established custom shops in Japan having opened back in 1989. Upon arriving, I was greeted by the two main men behind the company, Hideki Kato and Mototsugu Ueno, both of whom were happy to show me around the facility. 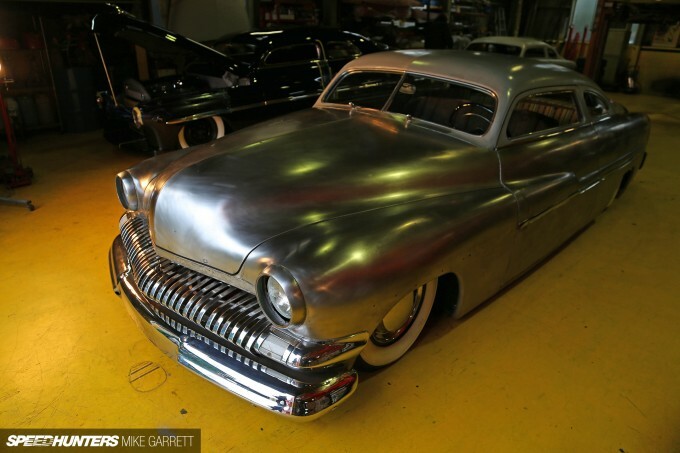 When it comes to the world of custom car building, there’s no model more iconic than the 1949-1951 Mercury. 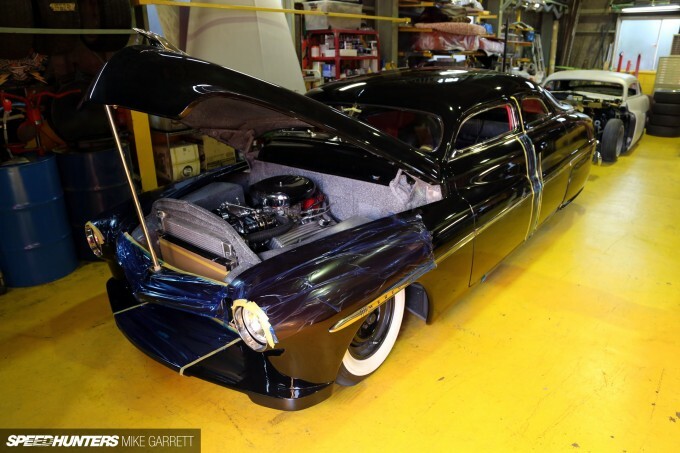 It’s the quintessential lead sled, and has been for over 60 years. 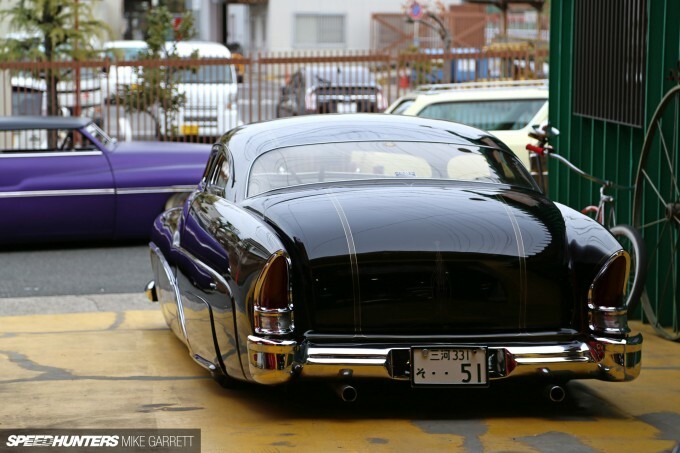 And given the affinity that the Japanese have toward vintage American custom cars, it’s not surprising to hear that the country is home to a number of badass Mercs. Border’s is the place where many of them were built. 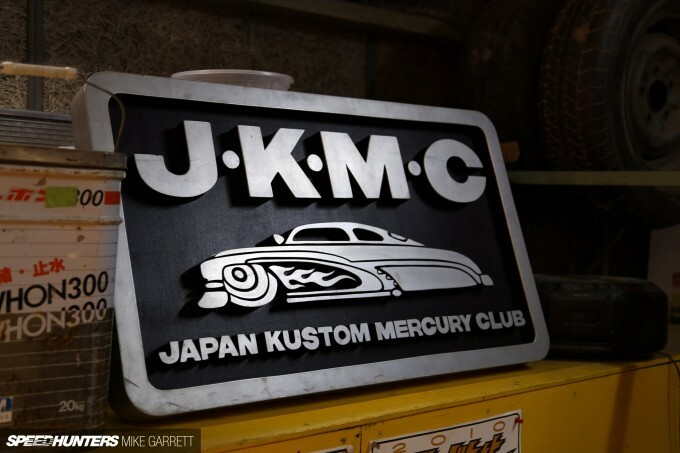 In Japan, Kato-san and Ueno-san are considered the masters of the custom Mercury, and on the afternoon I visited the shop they had a few different custom Mercs in various states of completion. 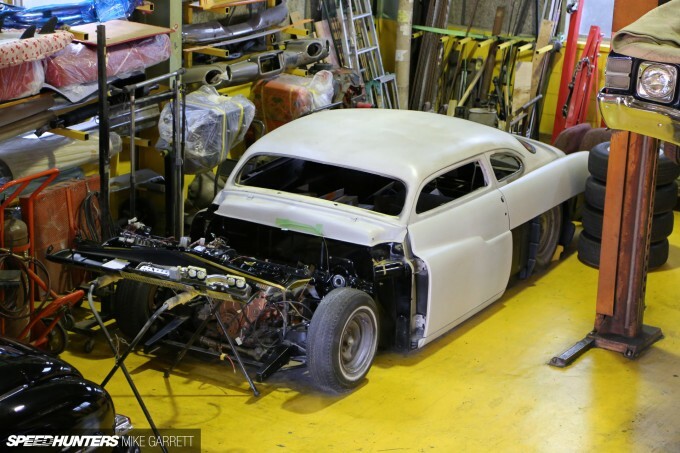 There wasn’t a stock version in sight, with all of the cars sporting chopped roofs, dropped suspension and plenty of custom bodywork. 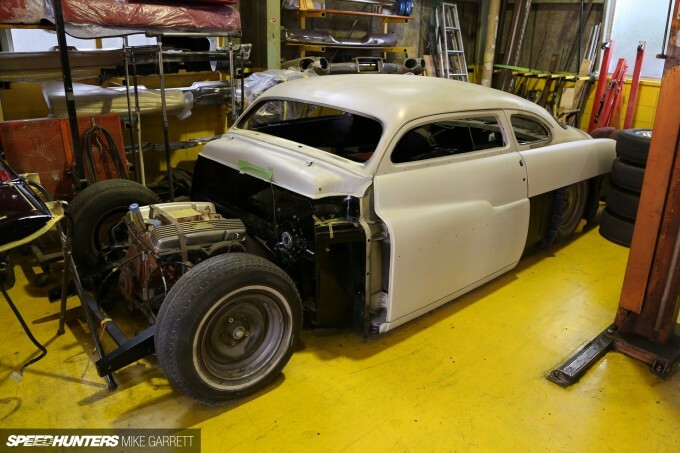 In one corner sat this rather sinister looking ’50 sedan known as Akebono, which was undergoing some maintenance. In another corner sat a two-door car that still had quite a way to go before completion. Even so, you could see that the project was off to a good start, eventually set to join the many other custom Mercs Border’s has turned out over the last quarter century. 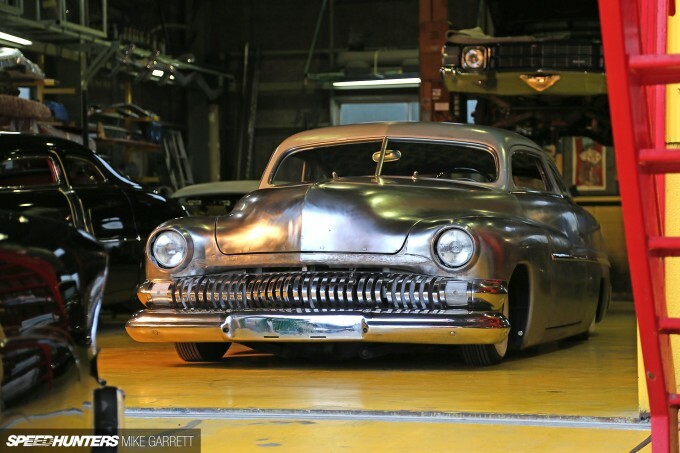 And given the years of experience that Kato-san and Ueno-san have building custom Mercurys, you could say their work easily rivals that of builders from the US or elsewhere. 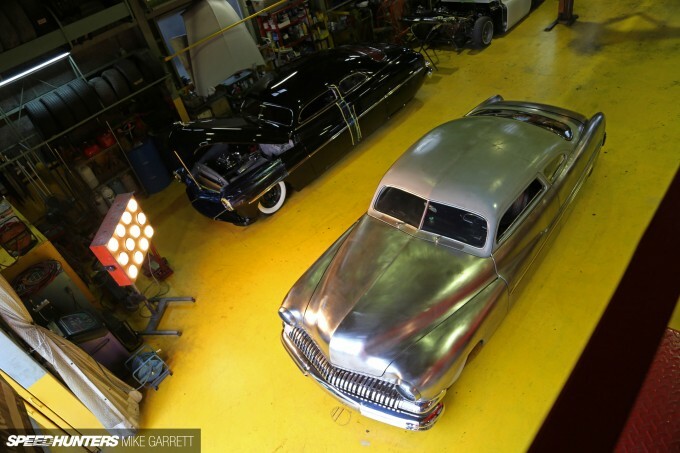 Their builds have taken top honors at events like the Yokohama Hot Rod Custom Show on numerous occasions. 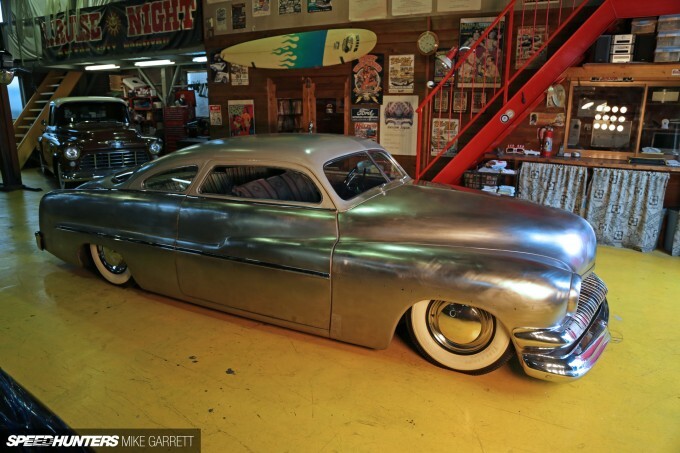 But it’s not just ’49-’51 Mercurys you’ll find at Border’s. 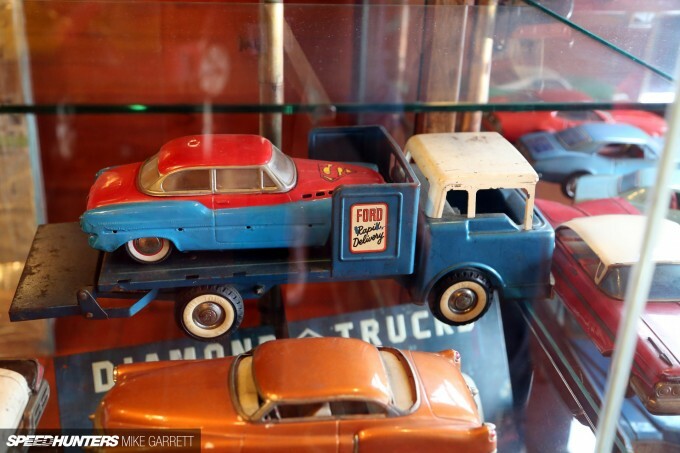 The guys also deal in other American machinery from the ’40s through to the ’70s. For example, on the day I dropped by, the group of Mercurys was complimented by this mildly customized Chevrolet pickup. 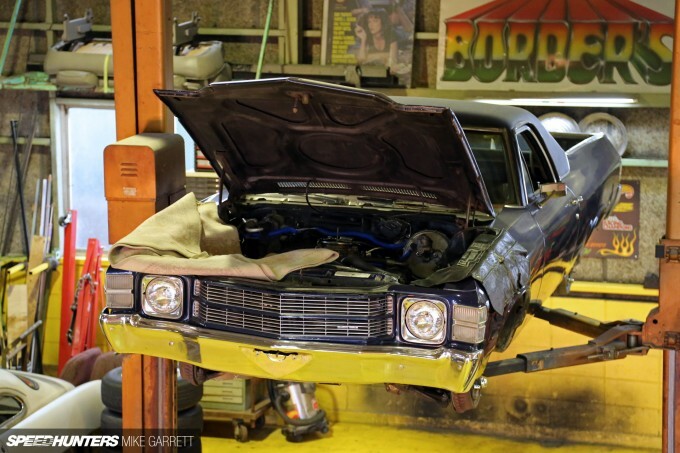 Up on the lift meanwhile, sat a customer-owned El Camino which was receiving some basic maintenance. 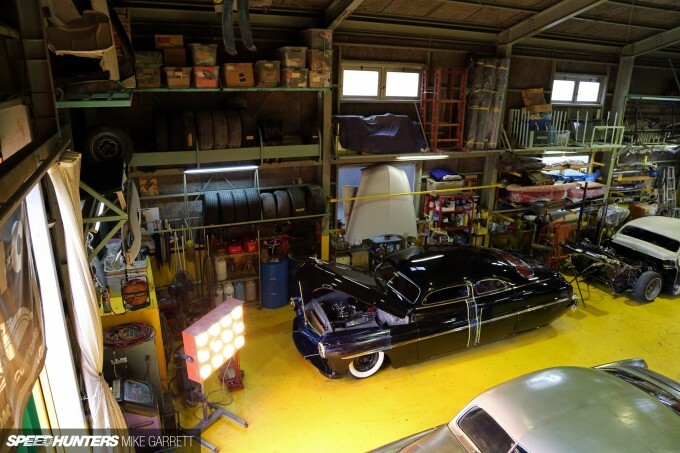 Shops like Border’s are the reason that regular people in Japan can own and drive vintage American cars without having to stress over maintenance and parts availability. I also spotted this chopped and heavily customized ’72 Beetle convertible known as the California Speedster. 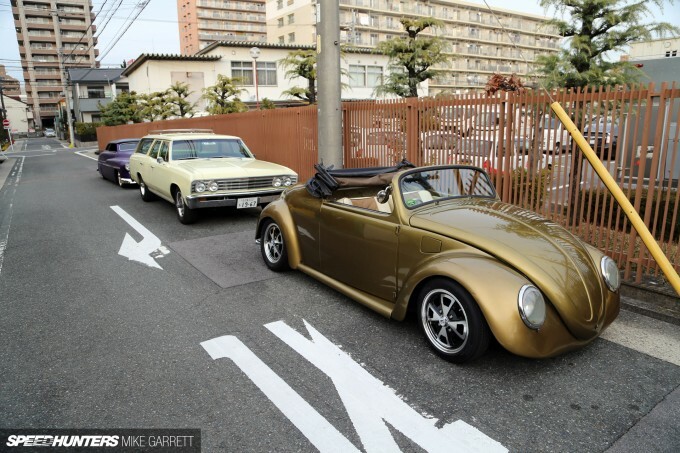 One more example of how close the air-cooled VW and American custom scenes are interwoven in Japan. 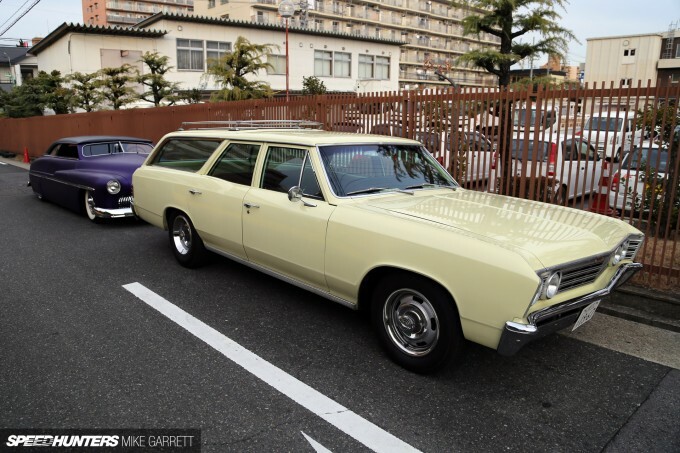 This ’67 Chevelle station wagon was actually built for a customer that wanted a cool car to transport his surfboards to the beach. Mission accomplished I’d say. 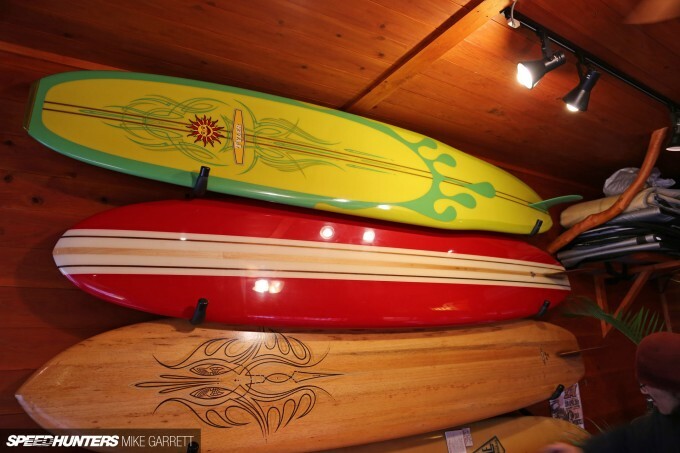 And speaking of surfing, Border’s is also well known for its custom longboards – and there are many of them on display throughout the shop. 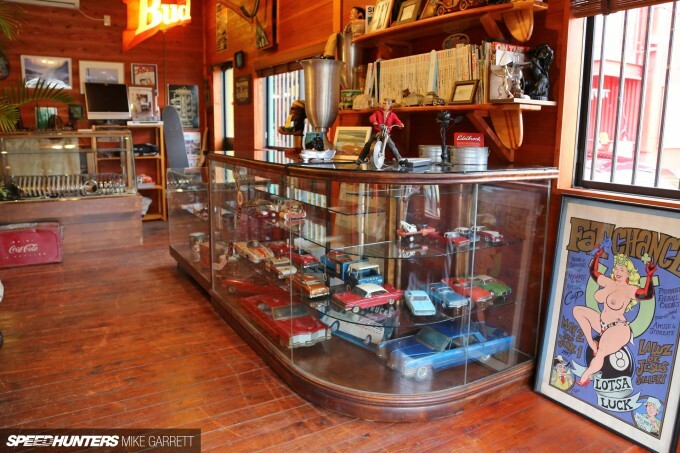 Another area of the shop is home to a lounge area which houses a massive library of vintage car magazines and books from both Japan and the US. 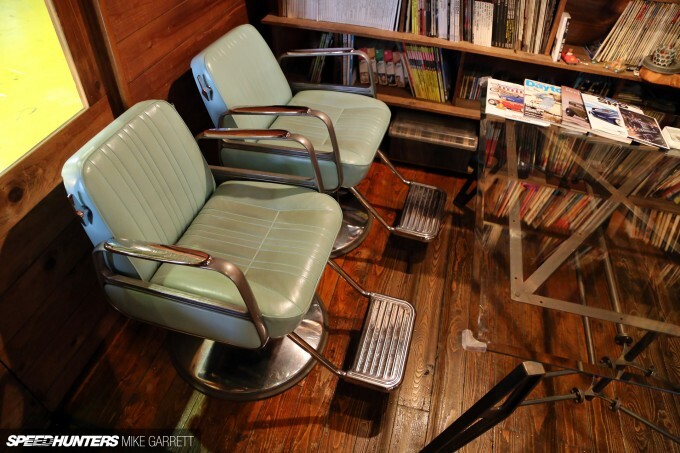 A keen sense of style has also been been put forth here, with things like vintage barbershop chairs for customers to sit in. 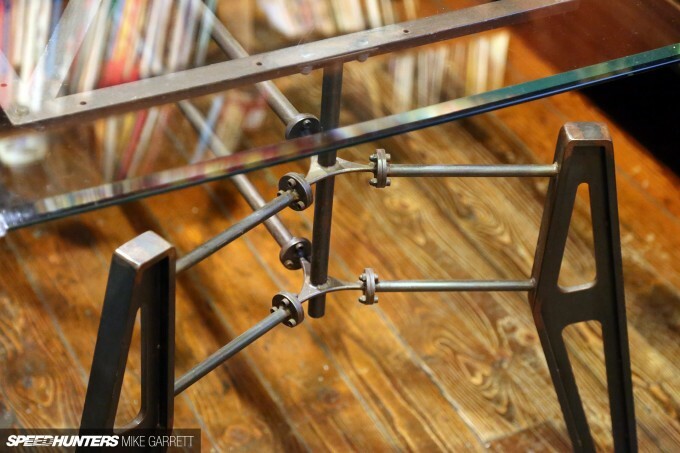 Even the tables are customized, handcrafted from glass and steel and nicely matching the shop’s decor. Naturally I was curious were the ‘Border’s’ name came from, and when I asked the question Ueno-san pulled out an old Japanese comic book of the same name. Both him and Kato loved the series when they were young and they figured it’d be a cool name to use for the shop. It also fits in well given the surfer vibe that surrounds the place. 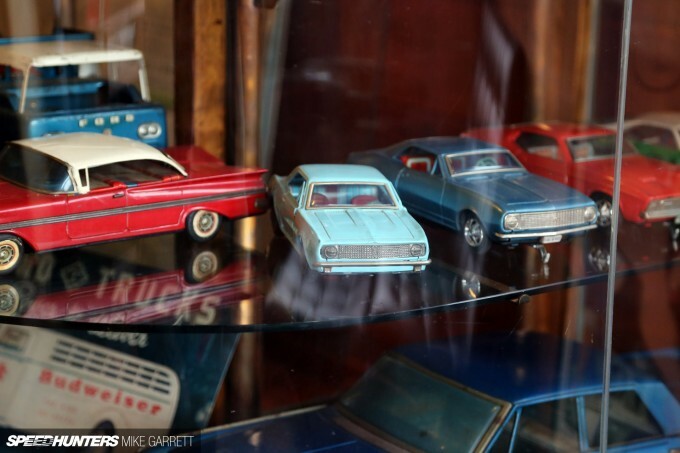 In addition to the main workshop and office, a separate area of the shop is home to a small museum’s worth of art, collectables and vintage toys. 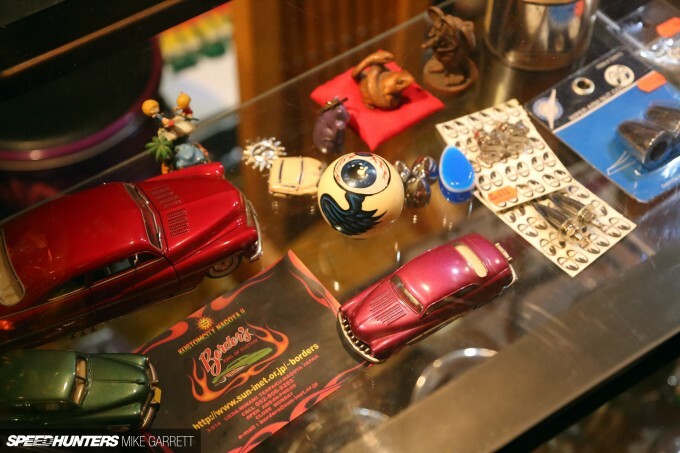 It’s here where you’ll find Kato-san’s incredible collection of rare toy cars from the ’50s and ’60s. Some are from the US, while others were made in Japan when its economy was growing back in the years following the war. 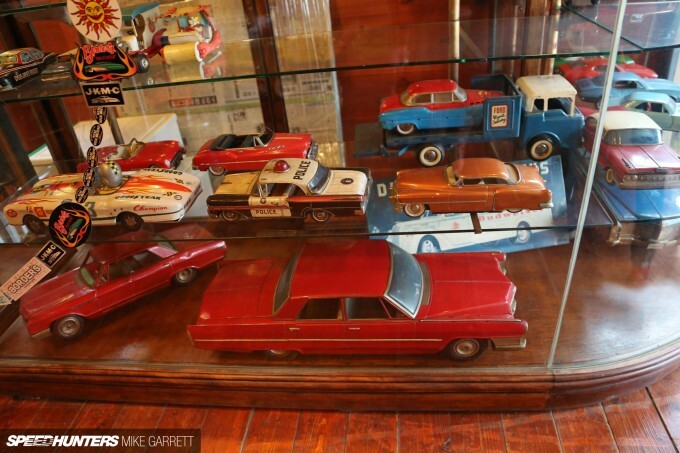 Most of these vehicles I’d never seen before, including that enormous red Cadillac sedan which had be somewhere around 1:10 scale. 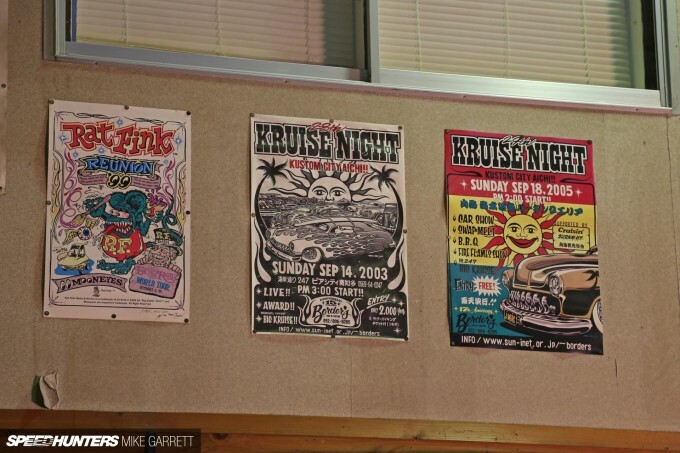 Elsewhere, there are event posters and magazine photos all around the shop which tell stories of Japanese custom car building over the last 25 years. 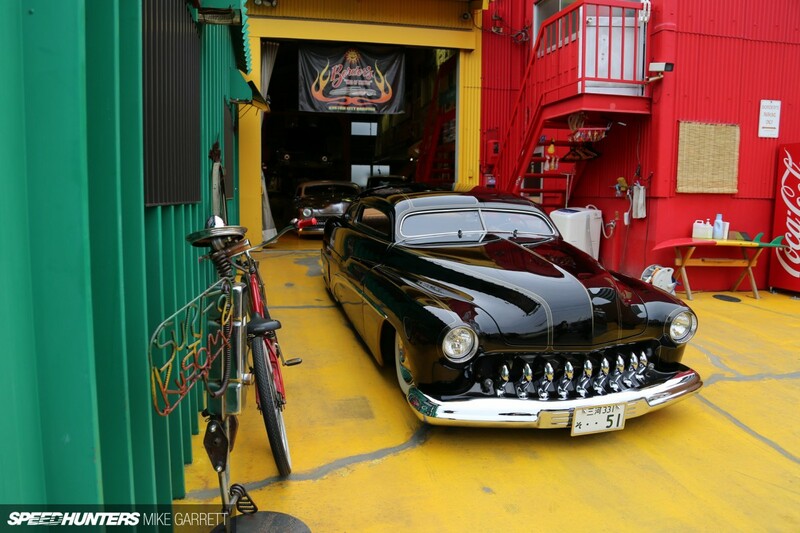 Once again, it also reflects the brotherhood that exists among Nagoya’s car customizers and gearheads. All of these guys have their own shops, their own clubs and their own tastes – but when they get together to go cruising it’s like everyone is family. It was just so cool to experience. 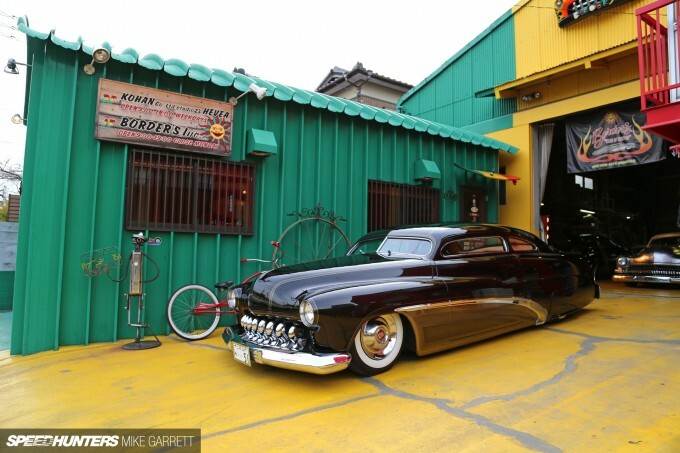 Whether its Border’s, Fellows, Cholos, Paradise Road or any of the other shops you’ll find in Nagoya, all of these guys share a love of building, cruising, and expressing themselves through their work. In a nation where conformity is king, these men have blazed their own paths, chased their dreams and built a ton of cool stuff along the way. 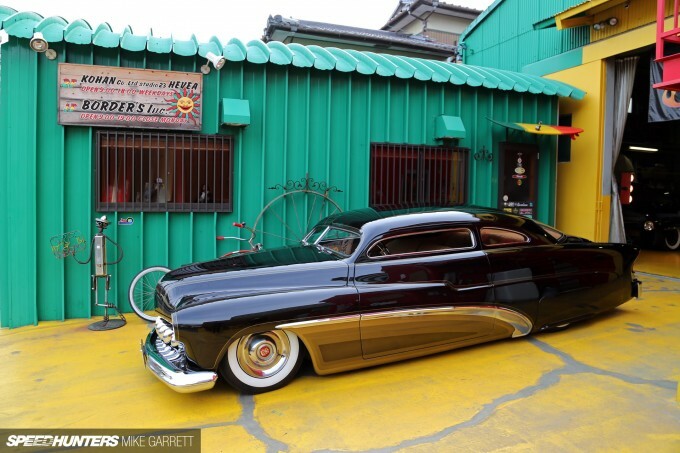 And with that I can finally wrap up my little tour of ‘Kustom City Nagoya’. I’d like to thank everyone who accommodated me during my time in the city and extend some extra special gratitude to Toshi from The Local Hero Japan for helping to put all of this together. It also just so happens that it’s getting to be time to start planning my next expedition to the fantastic place that is Japan, and I’m starting to get excited already. I wonder what we’ll find this time? Mike, if you didn't say anything about this place being in Japan, this piece would've passed as a So-Cal love story. It's amazing how the culture is in Japan, makes me think I could do a USA/Japan trip on one plane! Just awesome mate! That's a really nice looking VW California Speedster. 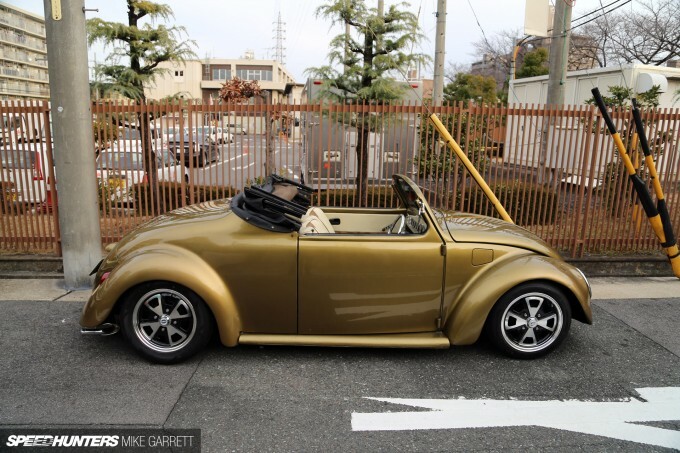 It's actually a kit car and you can still buy the parts necessary to convert a regular beetle into the CS, though I don't think I've seen one as nicely done as that in any photos or shows. Good stuff. That the Mercs are amazing goes without saying... It's the little guy that caught my eye! These Merc's are slick, especially the purple one outside! Also diggin the truck, my kind of old school ride! 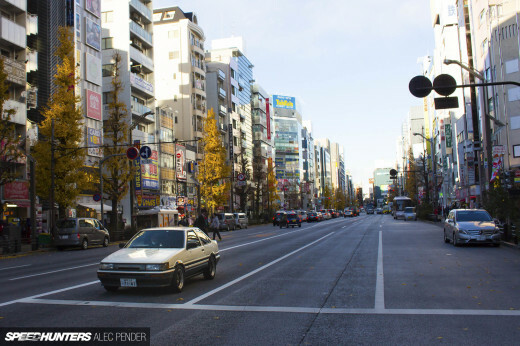 Great post yet again, awesome seeing Japan rocking it like that. 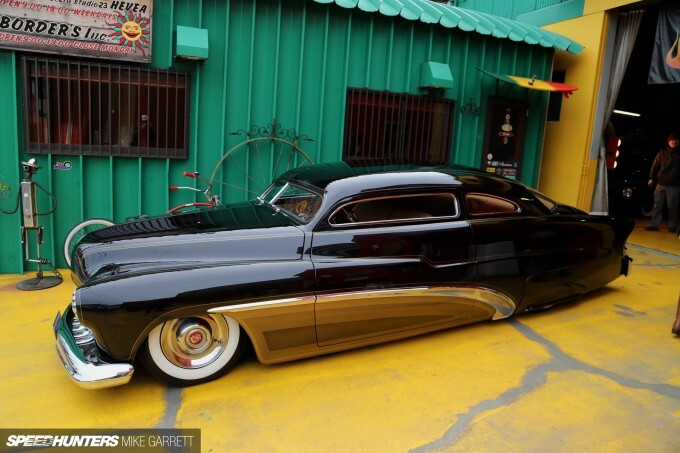 Cadillac Sombreros are the best wheel covers of all time. Man here it comes again.!!! The Japanese are schooling us all.....Boys take note this is how it is done. One thing that I keep coming back to is, they must have a pretty good economy. 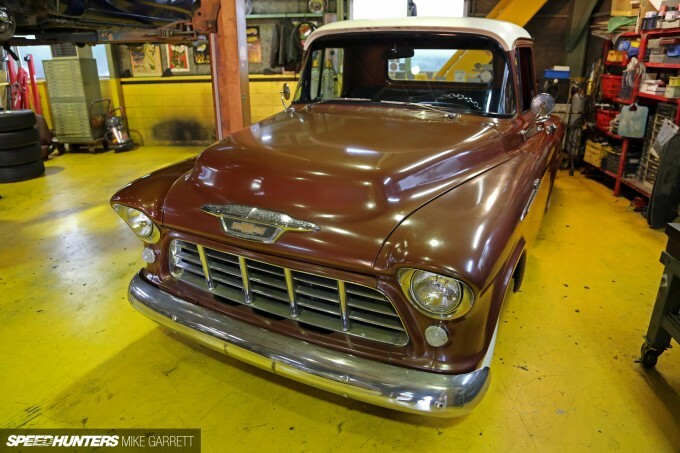 These cars are expensive to even acquire as a rusting hulk, Mercs that is. I couldn't imagine being able to buy one in a field much less shipping it over seas all that that goes with it. These guys have gumption. Stunning series Mike! Many thanks for putting it together. I'd love to see this kind of sweeping coverage on those mad Scandinavians please. I'm imagining crazy fabrication inside. 6 feet of snow and eternal twilight outside. Hey Mike this is unrelated, and I may have asked before, but have you ever run into Team Pantera of Japan? Hey Mike, it must be very hard to find these wonderful shops but even harder to leave. WOW! This was next level! mrrick Yeah it was tough, especially considering how much stuff was packed into my time in Nagoya. DaveT Seen there cars at a couple events, but that's actually something I'm looking into for my next trip. smithadamb Thanks a lot. Glad you enjoyed it! gliebau It does have some very cool lines for a kit car! The One Otaku It depends who is doing the work obviously, but it might not be much more expensive assuming you can source all the parts. Chris 'Haffy' Hafner Thanks Chris! 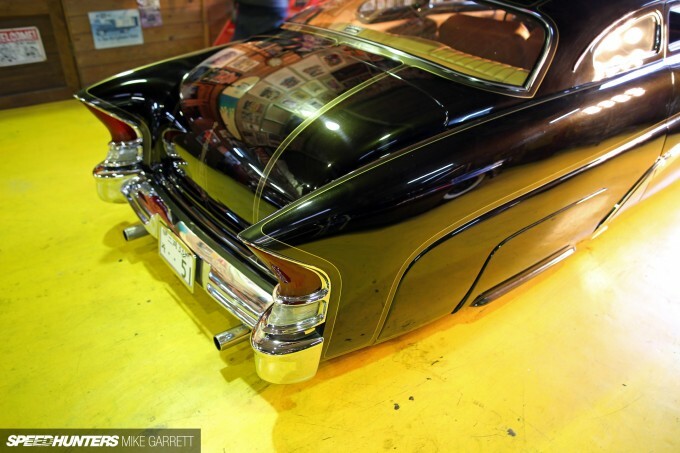 donkyyyyyy Don't get me wrong, there's a lot of exquisite custom US Iron in Japan, but if you think they are schooling us; you haven't been to many of the big car shows/shops in the states. Absolutely. I've been saying the exact same thing ever since SH started to feature hot rods and customs from other places than the US. It's pretty cool, but they're fram from what the US is capable of, and SH is simply missing out not giving them the attention they deserve. dadecode donkyyyyyy I'm well aware of what is being built here in the states. Very aware. But I feel that the Japanese are more willing to go outside of the box and able to really do some awesome work. Even when doing the overrated Mercs they still seem to be doing something different with them. I just dig their work and they are usually on par with what I like. 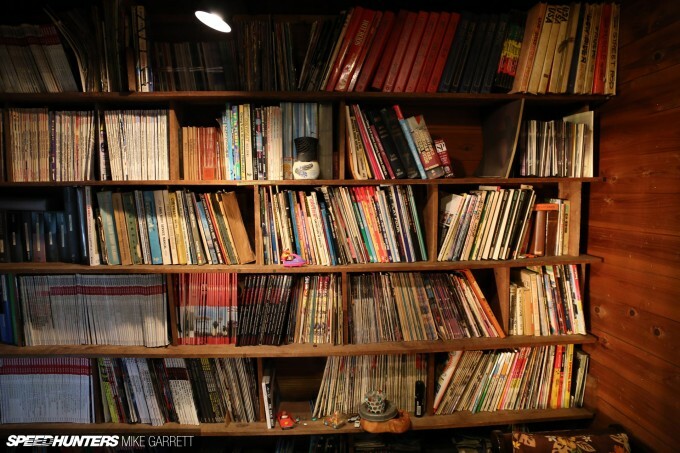 Mike Garrett DaveT If we ever meet I owe you a hearty handshake. Hi there, I'm now in Japan, Kyoto are there any other shops in Nagoya besides Borders & Paradise Road? Thx.